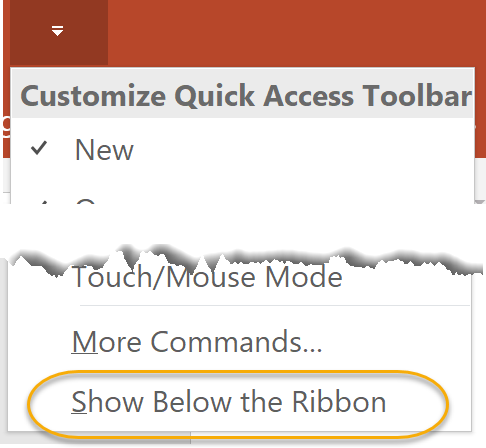 By default, the Quick Access Toolbar is located in the top left corner of Microsoft PowerPoint. Undo. Click Undo to undo the last action performed. Redo. Click Redo to repeat the last action performed. Start from Beginning. Click Start from Beginning to launch your presentation from the first slide in Slide Show view. From the drop-down list, select More Commands... (near the bottom of the list). From the left-hand list box (circled below), select a command and click Add > >. Right-click the command or the group name. 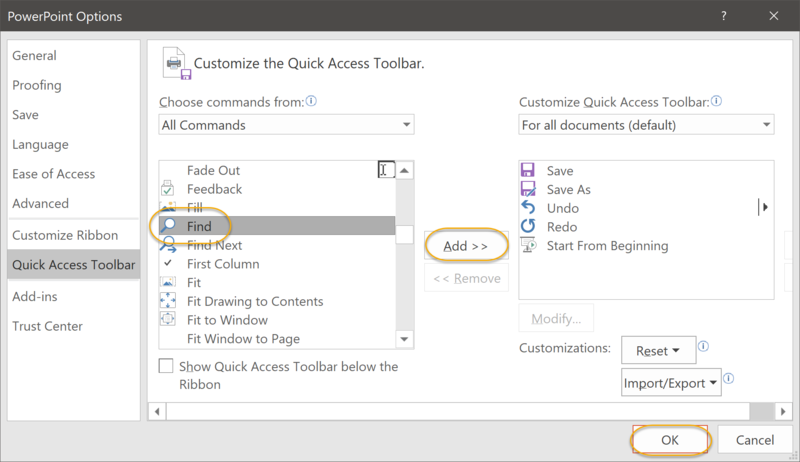 New: Click the drop-down arrow to the right of the Quick Access Toolbar and select New. 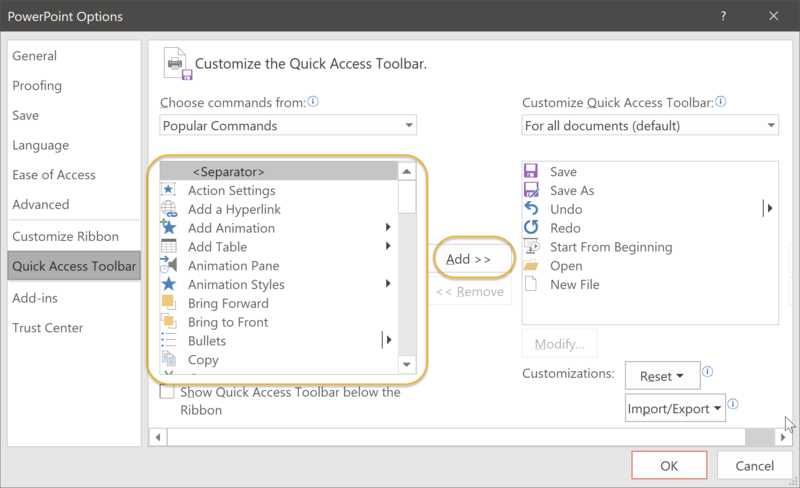 Open: Click the drop-down arrow to the right of the Quick Access Toolbar and select Open. 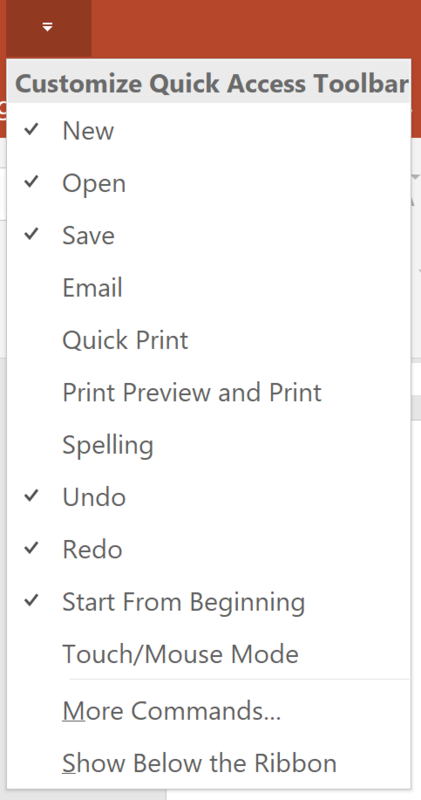 Quick Print: Click the drop-down arrow to the right of the Quick Access Toolbar and select Quick Print. 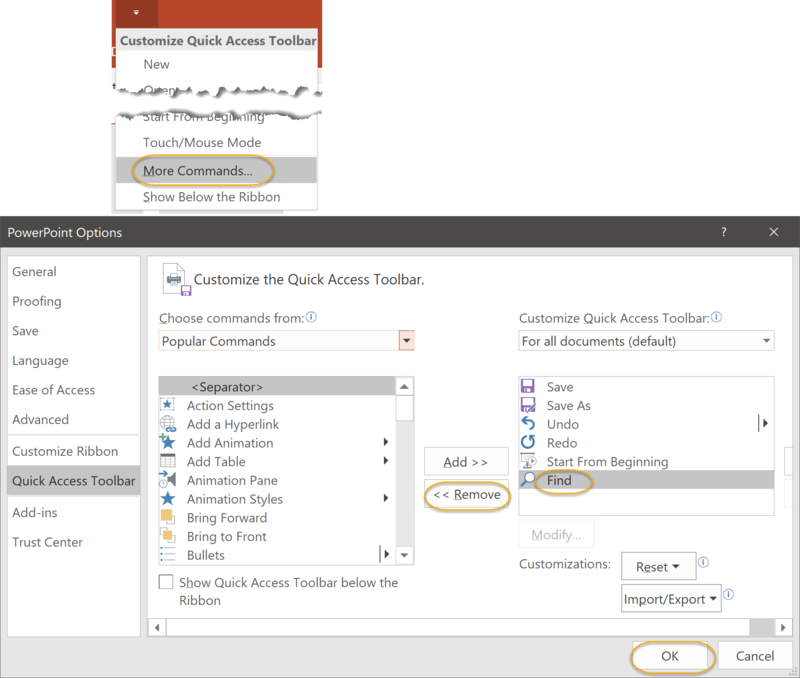 Paste: Click the drop-down arrow to the right of the Quick Access Toolbar and select More Commands... 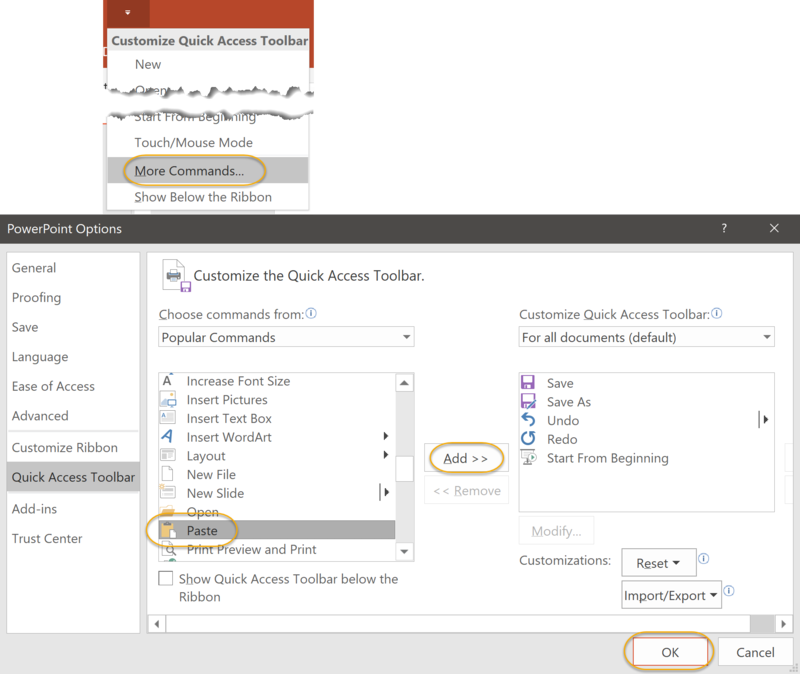 Highlight Paste in the left list box, click Add >>, and then click OK.
Find: Click the drop-down arrow to the right of the Quick Access Toolbar and select More Commands... 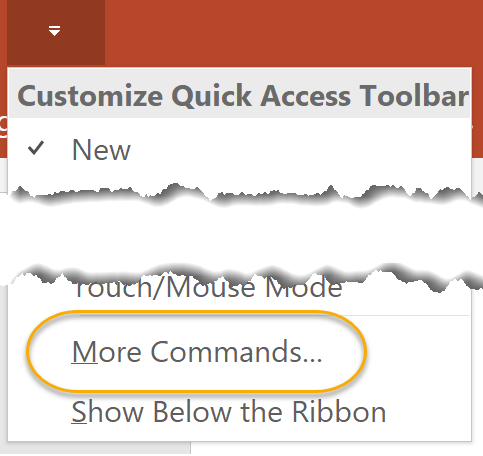 Highlight Find in the left list box, click Add >>, and then click OK.
Click the drop-down arrow to the right of the Quick Access Toolbar and select More Commands... 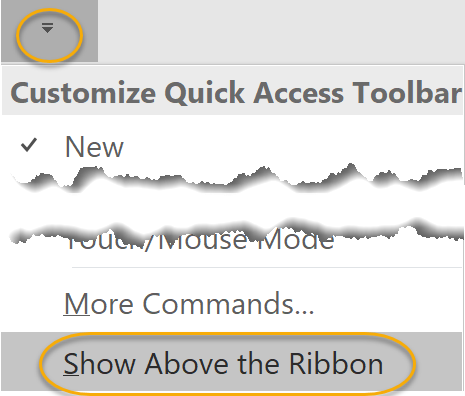 Highlight Find in the right list box, click << Remove, and then click OK.